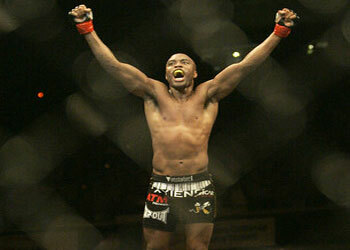 This Saturday will mark UFC middleweight champion Anderson Silva’s first title defense in six months. After his lackluster performance against Patrick Cote at UFC 90, Silva is anxious to remind the MMA world of his dominance. Silva will be taking on fellow Brazilian Thales Leites at UFC 97 at the Bell Centre in Montreal, Canada. Although Leites is young, the champ knows he better be on point if he intends to leave the Octagon with his belt. Before he allowed Cote to take him into the 3rdRound, Silva had schooled all of his previous seven UFC opponents before the 10-minute horn sounded. In a sport as unpredictable as MMA, it would be tough to say that Silva is bored, even though that seems to be the case at times. He may have his sights set on Leites for now, but he already has a boxing match against former light heavyweight champion Roy Jones Jr. on his radar as well. Silva and RJJ have a lot more in common than most think. They will both go down as arguably the best to ever fight in their weight class for their respective sport. On the flip-side, each dominated their division at a time when the field was never able to narrow the gap between good and great. RJJ captured the vacant NABO light heavyweight championship with a 5thRound TKO over Omar Sheika on his “March Badness” MMA/Boxing hybrid event earlier this month.